Yesterday I went to the local office for my congressman. It was a scouting expedition. I had never been before and was curious to see how it was set up. There were two columns to the right of these issues, the first column was how many were for the particular issue, and the second was how many were against. The surprising thing to me was there were only 22 tick marks total! In the last week only 22 people had dropped in to register their concern about various issues. And of the above twelve issues, six of them were raised by just one person. If your congressman has a local office close to you, it may be worth a few minutes to drop by and register your concerns. You could easily be the only person to raise your particular issue that week. If you happen to visit your congressman’s local office, please tell me how it goes. Minutemen contributed to the colonists’ victory in the American Revolution. These men were the early response team of the local militia. Minutemen were trained to react quickly. The success at Lexington and Concord was due in part to the rapid mobilization of minutemen, citizens who cared about their rights and opposed the dictatorial degrees of the king. I recently came to the conclusion that I am a Minuteman Lobbyist. I was introduced to politics at a young age. My father helped with several campaigns. He encouraged my political education by paying me a penny a word to write letters to our congressman and senators. In my early adult life, I ran for California State Assembly, 23rd district, but lost in the primary by about a hundred votes. Over the next ten to fifteen years, I was involved in several local campaigns. Lately, I’ve wanted to be more involved in politics, but haven’t made the time to join a major campaign or crusade. I realized that sometimes we make getting involved in politics more difficult than it is. One goal of this blog is to help people to take part and be effective, but in a manner that fits in our busy lives. Last fall, I started calling my representatives. During my lunch hour I could reach out while walking from my cube to the cafeteria. A few weeks later, I started sending emails. It was simple to craft a short letter and send it to my congressman, my senators, the President and Vice President. Now, I take a few minutes to contact my representatives several times a week. You may think that your voice will be a drop in the bucket. While Congress as a whole may get as many as 80 million emails a year, the average congressmen gets in the neighborhood of a thousand emails and voice messages from his constituents each week. The messages are scattered across dozens of topics. A few extra constituents who push for one side of a position can wake up a congressman. Congressmen are worried about getting re-elected. The main reason professional lobbyists have any influence is because they’ll give money to congressmen, which helps them get re-elected. You have the inside track. Your congressman really, really wants your vote. Tell him what he needs to do to get your vote. Most representatives only accept email via their websites, so find your congressman and senators’ email web pages. Add the pages to your favorites list. Also, save the email web page for the President and Vice President. Now when you have a couple minutes, write the body of a letter, paste it into each of the web pages, and add an appropriate greeting for each person. To make a big impact, arrange to meet your congressman and senators. It is also very effective to get to know their staff. Letters are not as effective as they used to be, largely because they don’t reach your Congressman for three and four weeks, due to the 2001 Anthrax scare. Some say faxes are very effective. The more people you involve in your effort, the more of an effect you’ll have. 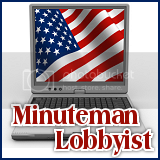 Invite your family, friends, neighbors and others to be a Minuteman Lobbyist. Encourage them to read this post. If your browser works with your mail client you can click here and simply add the email addresses of people you think may be interested. Here are a few more ways to encourage others to be a Minuteman Lobbyist. 1) Start contacting your representatives! Make a reasonable goal. For example commit to do ten minutes every day for three weeks. Or make at least one phone call or send one email every day. Then tell someone. Tell a spouse or a parent. Or tell a good friend. Ask them to call you in three weeks. Once you are accountable you are more likely to keep your commitment. Every day call or send email. Make a note to yourself. Put it on the calendar. Mark it in your planner. As you read the newspaper or surf the internet, keep an eye out for issues which you consider important. After three weeks step back and reevaluate. Ask yourself: what is a reasonable goal for the next couple weeks, or couple months? Maybe you just want to call three times a week. If you need the extra motivation, tell more friends about your plan. Now start over. 2) Invite your friends to join you. Ponder who of your family and friends might be interested in giving feedback to politicians. Tell them how easy it is to contact your representatives. If they are local and have the same representatives, you could even send then the same URLs and phone numbers. Here is a sample. The Founding Fathers risked their lives to help create this country. Many of the Minutemen gave their lives. Please consider giving a few minutes a day of your time to lobby your representatives. It is the right thing to do. Thanks to Glenn for the Instalanche! You can help support this effort by adding the Minuteman Lobbist icons to your blog, web sites, and other places. You can just copy the above HTML into your blog template. Below are a few sample emails you might send to people to encourage them to each be a Minuteman Lobbyist. You are welcome to use these as templates. If your browser works with your mail client, then you can speed up the process by clicking on the “Mail This!” links, and just add the email addresses of your friends and family. Otherwise, bring up your mail client, copy in a template from below, and change to suit your tastes. A low key email – Mail This! It only takes a minute to make a difference. A little more forceful – Mail This! Then please pass on the message. If you have a suggestion for another template, please leave a comment. 1) Duty. As citizens of this country we should be involved. 2) Maybe make a big difference. Fairly often votes in Congress will be close. It is possible that a few people will push a couple key congressman one way to make the deciding votes. 3) Become better educated. By spending a little more time reading the news and writing about it, you’ll have a deeper understanding of what is going on in our country. 4) Have fun. Several times our congressman has called to follow up on our emails. My fifteen-year-old daughter was excited for days when a Congressman’s aid called and my daughter was able to explain part of the Constitution to the aide. 5) Have a creative outlet. Writing your representatives can be a forum for your creative juices. 6) Make it a social activity. You can get together with several friends and neighbors to coordinate your weekly emails. 7) Less guilt. By doing something positive you won’t feel guilty about not being involved. 8) Good example to your children. As you write and call your congressman, your children will see what you are doing and follow your example. 9) Education for your children. Include your children. Have them write or call. My older two daughters have been writing for a couple months now and they now read the front section of the paper so they can follow the issues. 10) Be useful. It is easy to be distracted by the myriad ways to be entertained today. The average American watches six and seven hours of TV a day. It is easy in our society merely go through life. Be a Minuteman Lobbyist and do something useful. 11) Small efforts add up. Ten minutes a day, five days a week, comes to more than forty hours a year. 12) You can’t ignore the government. The government is taking over more and more of our life. A hundred years ago the Federal government was a small fraction with a miniscule budget. Now we are subjected to 27,000 pages of laws, and the budget has grown to 3.5 trillion dollars. If you have other reasons to be a Minuteman Lobbyists, please add a comment. Ask your friends, ask family, ask your neighbors, ask anyone you think might be willing to take a few minutes at least once a week. Send them a link to the main post on being a Minuteman Lobbyist. 2) Use Reddit, Digg, Stumble It, Delicious and so on to spread the word. Paul Revere helped spread the word to bring the Minutemen into action. You can provide a similar service to asking others to be a Minuteman Lobbyist. If you can think of other ways to spread the word, please add a comment. The following are a few ideas on how to make your exchange with politicians more effective. If you have some additional thoughts, please leave them as comments. I may update this post with suggestions I like. 1) Be polite: Calling politicians names or being offensive will not bring them around to your point of view. 2) Be short and to the point: A multi-page email will not be read. Congressman are receiving thousands of emails, voice messages, letters and FAXes each week. Some senators receive thousands a day. Their staff does not have time to read a novel. 3) Let them know you are watching them: Too often politicians will make sweeping promises, and rarely suffer any consequences. By reminding them of their promises they are more likely to follow through. 4) Tell them you are vocal: If you have a blog, mention that you wrote about this issue on your blog. If you wrote a letter to the editor, tell them. If they see you as one with more visibility and influence, they’ll place more importance on your message. 5) Get others to be involved: A friend once told me that a good man can do the work of ten, but a great man can get ten men to do their work. By inviting and encouraging others to join you in your crusade to make a difference, you will be much more effective. 6) Try to schedule a trip to their local office. You can meet the staff members, get their names, find out who is responsible for issues you care about and ask how they would like to be contacted.